The MIT Libraries, MindHandHeart, and MIT Medical are pleased to announce the launch of the Calm-to-Go program, designed to help anyone experiencing stress to experiment with different strategies to calm their bodies and their minds. 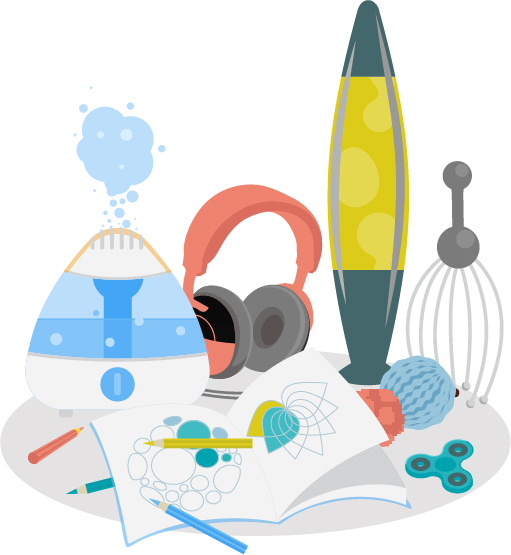 Now a pilot project, Calm-to-Go enables members of the MIT community to check out equipment such as noise cancelling headphones, lava lamps, weighted shoulder wraps, aroma therapy diffusers, fidget boxes, and neurofeedback or biofeedback equipment from the Hayden Library. We invite you to explore the Calm-to-Go sensory collection and get a feel for which equipment works for you. All Calm-to-Go materials are available for MIT community members to borrow for two weeks and use at home; you’re also welcomed to use items that don’t emit aromas, sounds, or light while you’re in the library. All items in the Libraries’ circulating Calm-to-Go collection are listed in Barton; do a title search on “Calm-to-Go” and click on “Find it in the library/request item” for a full listing of what’s currently available.